So, yesterday the three of us went into the US embassy in London to get Boy registered as an American citizen, his first passport (I can't wait! Two weeks for it to be delivered) and his social security number. It was a lot less hassle than I thought it would be (at the embassy at least, don't get me started about the lifts in the tube all being out of service and that we had a sleeping baby and a pushchair to drag up and down all those stairs) I just wish I had organised all of our documents a little earlier than I did. But we managed to find this cute little waffle place afterwards, and had that for lunch. 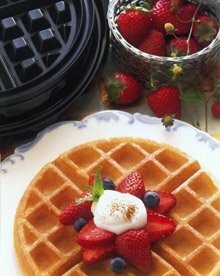 I love waffles. It completely made up for all the waiting we had to do.